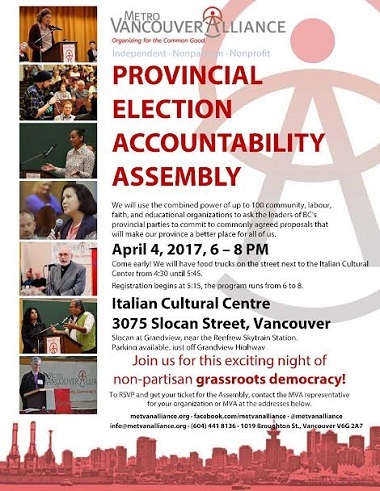 Next Tuesday (April 4), Metro Vancouver Alliance (MVA) will host a Provincial Election Accountability Assembly at the Italian Cultural Centre. The MVA has invited the three provincial party leaders to address its delegates. Thus far, John Horgan, NDP, and Andrew Weaver, Green Party, have agreed; the MVA is still waiting to hear from Premier Christy Clark, leader of the BC Liberals. Metro Vancouver Alliance is a broad-based alliance of 57 civil society institutions which work effectively, together, for the common good. Member and sponsoring organizations – faith, labour, community and educational groups (see below) – represent 200,000 people in Metropolitan Vancouver and more than 700,000 people across the province. At our Municipal Election Accountability Assembly October 19, 2014, we received commitments from local politicians on our civic agenda. [On April 4] we will be asking the provincial party leaders to support our efforts on Economic Justice, Affordable Housing, Accessible Transit and a Strong Foundation for Healthcare at the provincial level. BC has the second highest poverty rate in the country and is the only province without a plan to reduce poverty. A comprehensive poverty reduction plan will address social assistance rates, low wages, child care, education and health care. Persons receiving provincial disability assistance currently have their Canada Pension Plan Disability benefits clawed back by the provincial government, despite having contributed to CPP in their working years. This traps people in poverty, unable to support their basic needs. Working with you to develop and build popular support for a poverty reduction plan and the elimination of the Canada Pension Plan Disability claw back. Work with the Metro Vancouver Alliance and a broad range of advocates and organizations to develop and implement within one year of the election, a legislated, comprehensive poverty reduction plan for BC. As a first step in addressing poverty, commit to the elimination of the claw back of Canada Pension Plan Disability benefits for people on provincial Persons With Disabilities assistance. Failure to build new affordable housing units and repair existing housing stock over the past 30 years has led to a crisis in housing affordability. While attention has focused on the spectacular increases in real estate prices, there is also a serious crisis in the rental housing market. Rising land values have led to an epidemic of evictions as landlords have taken advantage of loopholes in the Residential Tenancy Act. Strengthen the Residential Tenancy Act to tie rent to the unit, instead of to the tenant, so that landlords cannot increase rents between tenancies, plus eliminate the parts of the Act that currently allow fixed lease contracts, renovictions and unfair rent increases because of geography. Commit to providing funding through a special grant to increase HandyDART service hours by 5% per year for the next four years, 2018 – 2021, for all TransLink and BC Transit HandyDART services. The funding for TransLink would be in addition to the service increases in 2018 and 2019 already supported through municipal property taxes. Primary health care (PHC) is the foundation of Canada’s health care system, providing access to both health and social services. But services like physiotherapy, counselling, home support and home care are becoming harder to access because patients are confronting a growing number of barriers, including financial and geographic. We support the commitment of the Ministry of Health to increase access to coordinated primary, community and social care services so that patients can obtain the right service from the right provider at the right time. Work with our member organizations in support of provincial and health authority efforts to increase access to primary health and social care by people across the province. Reach out to the medical profession to encourage dialogue with our member organizations which represent many hard-to-reach and under-served patients. Commit to establishing a primary health care partnership table, including representatives from Indigenous and multicultural communities, to identify strategies to reform BC’s primary health care system. Work with the Metro Vancouver Alliance and the BC Association of Community Health Centres to develop an annualized global funding model for Community Health Centres in British Columbia that encompasses the package of salaried, team-based primary care, health promotion, disease prevention, community development initiatives and social services. Invest in 20 new community-governed, not-for-profit or cooperative Community Health Centres throughout British Columbia to provide more British Columbians access to primary health care when and where needed. If your organization isn’t affiliated yet – for example a church/faith group, a union, a community group like a resident’s association, advocacy group, or non-profit or an educational institution – get in touch and one of our organizers can let you know how your group can join MVA. ← Anti-Islamophobia Motion M-103 has passed – now what?